I’ve been to vegan festivals all over the UK, from Brighton to Bristol, Newcastle to Edinburgh. They become more numerous every year and it would certainly be a challenge to attend them all. Being a Scot, there was something really heartening to see how much Vegfest Scotland, held in Glasgow’s SECC, has grown and developed since its first event last year. Aberdeen and Dundee now have their own vegan festivals and with each event doing so much to spread awareness of veganism, I can only predict that this wonderful trend of expansion will continue. It’s not every day I have dumplings for breakfast, but to be honest, many exceptions are made for Vegfest. I simply couldn’t resist the Holy Cow stand, with its massively elaborate-looking burgers, fabulously attractive cake selection and the aforementioned dumplings. I knew I had to pace myself, so settled on just the Italian style dumplings. (I had Polish style ones the next day, which were equally nice. This dumplings-for-breakfast thing could become a habit…) Holy Cow is a brand new Edinburgh based fully vegan cafe. You can find them near the bus station in Elder Street. I cannot wait to go there for a meal. It’s great to have another one hundred percent vegan place in Edinburgh! My first day at Vegfest was mainly taken up with buying things. Yes, I could use the excuse that, being December, I was doing some Christmas shopping, but that would (mostly) be a lie. I mean, I did get a few gifts for loved ones, but mainly I was on a totally selfish vegan shopping binge. I bought a fair amount of food of course – that goes without saying really – but there was so much to purchase besides grub. Firstly I have to admit that I caved and bought a tofu press. It shouldn’t really be a guilty admission, but until now I’ve been pressing tofu punk-style by wrapping it in tea towels and shoving a bunch of heavy cookbooks on top of it, so it seems like a bit of a sell out. However, the handy device I purchased not only acts as a neat press, but also doubles as a perfectly sized marinating tray. See, I’ve always struggled with getting a bowl big enough but shallow enough to marinate tofu efficiently and effectively, so I think this is where it may come into its own. I look forward to using it. So many charities made an appearance this year, including many smaller causes that I hadn’t heard of before. I’d met the folk from The Scottish Animal Behaviour and Rescue Centre at Edinburgh’s Vegan Festival in August (they do amazing work) but new to me were the Underheugh Ark, an adoption and fostering organisation that aims to save dogs from England’s cruel ‘seven day rule’ which sees them put to sleep after that time if not claimed. Another that caught my eye was the Maggie Fleming Animal Hospice who provides care for terminally ill abandoned animals. Could there be any more touching charity? There was also an organisation called Give a Dog a Bone, who assist older dog rescuers meet the costs of having a canine companion. I was lucky enough to have a chat with one of the members of Save Movement Scotland at their stall and attend one of their talks later. She showed me video footage of animals that they’d filmed here in Scotland, arriving at their final destination by truck, looking confused, frightened and uncomprehending. It was utterly heartbreaking. For our own sanity, it is easy to imagine that local farms are not as cruel as those further away, but here I was, confronted by images from my own back yard. The bravery of those who confront not only the truck drivers, but those who open the gates of the slaughter houses, astounds me. Many would see the save movements – which started in Toronto, Canada I think- as an exercise in futility. I mean, what is the point of upsetting yourself by bearing witness to the suffering of animals which you don’t have a hope of saving? Later on at the Save Movement Scotland talk, I found out that the peaceful protesters confront passersby with what is happening and let them know why it’s wrong. They also chip away at the consciences of the drivers and abattoir workers and security guards. These people may not acknowledge that it’s cruel and unnecessary to use animals in this way in front of the protestors, but what grains of doubt are planted in their minds? What conversations do they have with their family when they get home from work? It is a subtle and heartrending form of outreach and hopefully one day, I’ll feel emotionally strong enough to join them. On a lighter note, the array of t-shirts on display this year was truly fab, especially by the charities. I bought one from the League Against Cruel Sports and one from the Coalition to Abolish the Fur Trade, both noble causes. Clothing in general was top notch, especially on the Viva La Vegan stand. They even had bags that celebrated the vegan cheese/gary debate! Cosmetics in general are well represented at Vegfest and I had a lovely chat with the owners of Iuvo Skincare at their stand. Their handmade soaps smelled and looked amazing, and their skin cream felt brilliantly smooth. They also had a selection of fragrant oils which I enjoyed sampling. In the end I bought a mixed box containing all these items. Well, it’d be rude not to. On my second day at Vegfest I attended a brilliant talk by Vegan Geezer himself. If you’re not familiar with his work, check him out on youtube. In fact, that was what his talk was about – utilising youtube for activism. It was fascinating and I took lots of notes. The reach you can achieve is phenomenal and for anyone who wanted to take the vegan message to a greater number of people, there were loads of tips. Talking of interesting outreach, Animal Equality were there with their virtual reality headsets. If you’re not familiar with these, they put you right onto the kill floor with British pigs. Participants put on the VR headsets and headphones and it’s as close as most people would ever want to get to the reality for these factory farmed animals. I witnessed a few individuals with tears in their eyes as they finished their experience. It’s no wonder really. I must admit to being surprised how many people were willing to try it – they were busy all day on both days. I’m sure it’ll help many people become vegan. I’m conscience that I haven’t said too much about the food at Vegfest so far. Believe me, while chatting to folk or browsing I was invariably munching on something scrummy. I’ve mentioned Holy Cow, but Brownins Vegan Carribean Food deserve a mention just for their dumplings (I know, I know, but they were a different kind of dumpling.) They also did magnificently massive jerk soya wraps, which I simply didn’t have room for, but saw others devour joyfully. Cool Jerk Pies had some festive offerings, with a vegan version of pigs in blankets as a topping. Cakes were everywhere of course, including my two favourite purveyors, Missy’s Vegan Cupcakes and Pitxu’s Cakes and Bakes. The macaron display was impressive as usual and well, basically the food was fab all round. A slice of pizza from the Bute Island Foods stand was heavenly. Cruelty free pigs in blankets – on pies! I also noticed them when I attended the monthly vegan quarter at the Leith Market in Edinburgh and it was great to hear the story of how they’d formed and what their approach was. They brave all elements to man stands in areas of heavy footfall in both Edinburgh and Glasgow and say they’ve had an overwhelmingly positive response. I’m sure if you’re a vegan you’ve had some sort of flack online (I know I have!!!) but it seems that people are less likely to insult you in person. Most people are curious and want to know more, which is why Go Vegan Scotland are there. I think it’s opened many people’s eyes and it’s great to have an information stall in busy city centres calmly giving out information and advice. Of course one of the main reasons I loved their talk was because I managed to win a hamper in their raffle which was drawn by a man dressed as a cow. I love Vegfest. Edinburgh is a beautiful city. It hosts the biggest arts festival on the planet (The Edinburgh Fringe) as well as the Edinburgh International Book Festival, Comedy Festival, Jazz Festival, Film Festival, Storytelling Festival, Food Festival, The Edinburgh International Festival (or ‘the grown up festival’ as it’s known in my house) as well as many other smaller festivals, so it’s no wonder really that Edinburgh is known as The Festival City. Why then, has it taken so long for Edinburgh to host a Vegan Festival? Well, I’m not sure to be honest, as all the elements to ensure its success are here. Edinburgh has a cosmopolitan population who enjoy food and drink (Edinburgh has more restaurants and bars per square metre than anywhere else in Europe) and who have the open, artistic outlook that makes all the other festivals such a hit. And so it proved, as when as I entered the inaugural Edinburgh Vegan Festival at the Roxburghe Hotel located in the West end of the city, they were debating whether to let anyone else in as the place was full to bursting. I’d wandered down there about an hour after opening and was lucky to gain admittance. The room I entered was crammed with people, all eager to sample the wares of the stockholders and generally have a good nose around. The first items that caught my eye were a very handsome display of vegan sporrans, by Freerangers. Being Scottish, I have been at many a function where I’ve been quite repulsed and saddened by the amount of leather and seal skin on display. Once I even came across what appeared to be a fox’s flattened face as a sporran, so it was delightful to see stylish, lightweight sporrans which weren’t leather. There was even a big furry one (oo-er) and several kilt belts. There’s always plenty to eat at these events, although in the crush it was a bit tricky to find something savoury. If I’d wanted cupcakes for lunch I would’ve been fine. I’m not complaining you understand, but surely a wrap or something must come first before the cake tasting begins in earnest. It was a lovely day outside and I know for a fact that the supplies of vegan ice cream were exhausted long before closing. Every stall holder I met kept mopping their brow and declaring that they didn’t realise how busy it would be. I’m so glad that the charities seemed to be getting lots of attention as well as the cake stalls. Viva!, a favourite of mine, was present, as were those intrepid types of Sea Shepherd. Animals Asia were happy to chat about their work to end Bear Bile farming and protecting cats and dogs from the cruel meat industry. The League Against Cruel Sports had a stall, rightly focused on the welfare of foxes. Population Matters is an ever increasing presence at these events and their creatively packaged birth control display had me chuckling. It’s a serious issue, but I’m glad they always seem to be smiling. Several local businesses seemed to be well represented which was nice to see. Henderson’s was here (an Edinburgh vegetarian institution and owners of the only all vegan restaurant in the city) as well as the Bread Street Brasserie, who do a vegan evening once a month. The Happy Pumpkin bakery seemed to be able to work magic, as not only were all their wares vegan of course, but many were sugar free, gluten free and most importantly, yummy! Their colourful stand was a real hit and particularly suitable for children. Nic’s Vegan Kitchen were selling boxed cupcakes and are due to open a nineteen fifties style diner very soon, which I can’t wait to visit. Missy’s Vegan Cupcakes, a regular at farmer’s markets locally, had her delectable and imaginative cakes snapped up by many an enthusiastic punter. The real drama however, was in the more open area towards the back, where pulled jackfruit resided, courtesy of local eatery the Bluebird Cafe. Now, I’m not sure if you’re familiar with pulled jackfruit, but it basically imitates pulled pork (although I’m sure it’s much nicer, plus no-one, y’know, has to die) and the promise of having it lovingly toasted in a wrap along with some melty Violife cheese (currently my favourite vegan cheese) was simply too much to resist. There was, however, a problem. The offerings of a Quesadilla, Wrap or Nachos had proved just too good. Coming up to lunchtime and they’d run out of jackfruit, the demand was so high. An anxious queue formed as a sign was hastily made ‘Jackfruit Sold Out – Back at 1pm’. Not to worry, a courier was sent to their premises in Cannonmills and although it seemed like forever, in less than 45 minutes all was well, the toaster press was fired up and production began again. As I sat on the ground (there was no room anywhere else) sipping my organic lemonade and tucking into my quesadilla, I looked around at the huge range of people milling about, eating, talking, laughing and my heart lifted. Here were people who were embracing veganism. Every talk and workshop was full; every sample was sampled and confectioners especially were simply cleaned out. I really hope that many attendees were non-vegans who came to experience for themselves just how diverse, delicious and delightful the vegan life can be. There were purveyors of ethical make up and skincare, support for older vegetarians, local restaurants who want to cater to us, charities who look out for our interests and those of the causes we hold dear, ethical jewellery and remedies. The representation of something for almost every aspect of the vegan’s life at the Edinburgh Vegan Festival gave me hope for the future and I’ll be honest, made me feel a bit fuzzy inside. But perhaps I’m being too maudlin. Perhaps the warm feeling in my stomach was simply the organic ginger beer and the cake that followed my savoury treat, but I don’t think so. Where on earth do I start with Bristol Vegfest? Over the weekend of 23rd/24th May this year, over 14,000 people passed though the Amphitheatre venue in the Harbourside area of the city to experience, celebrate and discuss all aspects of the vegan lifestyle. The emphasis this year was on the environment, to coincide with Bristol being the European Green Capital, as we all know what a devastating effect animal agriculture has on our environment. In addition to promoting a vegan lifestyle to combat this, the Vegfest also had countless recycling bins for waste and measures in place for a festival that was low in environmental impact. Everything from the posters and flyers to the generators and marquee build and breakdown was sustainable – even the loos were environmentally friendly! The number and range of stalls was certainly impressive. This is the biggest vegan festival in the country after all. Walking in at opening time on Saturday, it was easy to feel overwhelmed by choice. It was a hot day and perfect for the outdoor venue, but I did feel for those stallholders in the marquees, as they chugged down water and wiped their brows. So, I began with the animal charities, as I’m a sucker for a good cause and it also makes me feel virtuous about spending money. Cruelty Free International were there, having now merged with the BUAV to become one large anti-vivisection charity. Among the well known charities represented were Viva! who are one of my favourites. You could sign up for membership at the stall, as well as obtain all sorts of useful literature. I got a leaflet on going dairy free for my friend who is doing just that at the moment following medical advice. Their leader Juliet Gellatley gave a few of talks on why you don’t need dairy, how a vegan diet can help with menopause symptoms and the one I attended, how to become a school speaker. Their food and cookery co-ordinator Jane Easton also gave a talk and cookery demonstration – she is the author of the Viva! cookbook, which I can thoroughly recommend. Animal Aid were also a presence, not only doing talks, but they also had a stand with loads of goodies on it (I may have spent a bit too much, but a lot of it was on presents…) Have a look at their gift range here. An additional stall was present on behalf of their education department, so it seems school speaking is a real growth area for these charities. Get them while they’re young. The League Against Cruel Sports was also present and they were of course highlighting the proposed lifting of the fox hunting ban by the new Tory government, as were the Hunt Sabs. It was lovely to see several smaller charities do talks and have stalls, among them Wood Green Animal Sanctuary. Wood Green has four centres in England, which re-home every type of animal, from dogs and cats to farm animals. Their particular focus at the moment is on unwanted pets and the importance of rescue over buying. They are particularly concerned with puppy farms which supply pet shops, and irresponsible sellers on websites such as Gumtree and those who sell dogs in newspaper ads or even down the pub. Lisa Mitchinson gave an insightful talk on this in the Campaigns and Lifestyle tent. It’s a great issue to be highlighting and I support them fully. Another charity I noticed who was working on this issue was Protect a Pup, who work on free microchipping, low cost and free neutering and doggie food banks. An exciting area was the Vervet Monkey Foundation, who were trying to recruit volunteers to help in the care and rehabilitation of rescued monkeys in South Africa. As long as you have the means to get to them, they supply vegan food and accommodation for a small fee and you’d get the pleasure of feeding baby monkeys. Seems like the dream job to me. The Dean Farm Trust are a relatively young charity that I urge you to look up. I thought Fin Fighters was a fabulous idea, working specifically to end the use of shark fin. Marine conservation was very much in evidence with groups such as Sea Shepherd and The Black Fish both having stalls. By far the cutest stall (and I don’t mean to be patronising, only wildly complimentary) was that of Fleecehaven, the sheep sanctuary. They rescue sheep for all sorts of reasons and give them a loving home for life. Sponsor a sheep here. Of course we have to remember that plenty of non-vegans visit VegFest so there were plenty of stalls to show them how great the lifestyle can be. Veganuary are a great organisation who challenge people to go vegan for the month of January each year and it’s amazing how many who take part choose to remain vegan. The Vegan Lifestyle Association also supports those who wish to test the waters, as well as supporting more established vegans. The Vegan Society was of course present, being the oldest charity to provide vegan outreach, existing since the term was coined by their founder, Donald Watson, in 1947. I attended a great talk on activism by Dorset Vegan Lizzi Shaw, who has shown that if vegans don’t have much outreach in their own area, they can always create some for themselves! She is truly inspirational. There was also an opportunity to see how vegan shoes (courtesy of Wills and Bella Storia) can be just as smart as leather ones, so you can look good with none of the cruelty. All my shoes now are non-leather ones and I enjoy the look of surprise when friends find out that you don’t need to kill a cow to get something waterproof and breathable on your feet. Bohemian Chic Minerals have a fantastic range of make-up that’s not only cruelty free and vegan, but very suitable for even the most sensitive skin. This was great for me, as eczema has come and gone my whole life and this is the gentlest make-up I’ve ever felt. Eden perfumes give you a list of famous brand perfumes and list an equivalent they have made without any of the harsh chemicals. Their stand was very busy during the show with lots of wrist sniffing going on. Mount Purious have a range of skincare using various oils that I was very impressed with, as I tried some and my skin felt nicer instantly. Clothing was everywhere too. Many of the charities sold t-shirts and so on, but there were also specialist designers, such as Hempish and Viva la Vegan, both of whom had apparel that was lovely and softly wearable. Harsher in style, if not necessarily fabric was Vegan Cross, who are normally located near Kings cross in London. They were popular for their merchandise declaring legends such as ‘I Love Vegan Junk Food’ and also the vegan cheese and ham toasties they produced at the side of their stall. This was perfect for light hearted fun, in common with Vegan Sidekick’s satirical comics which you can view online, although of course it all does have a serious point to make. The array of caterers and food stalls was, as I have said, phenomenal. It would take forever to list them all (but if you’re interested, the list of all the stalls is available here) so I’ll simply highlight a few. 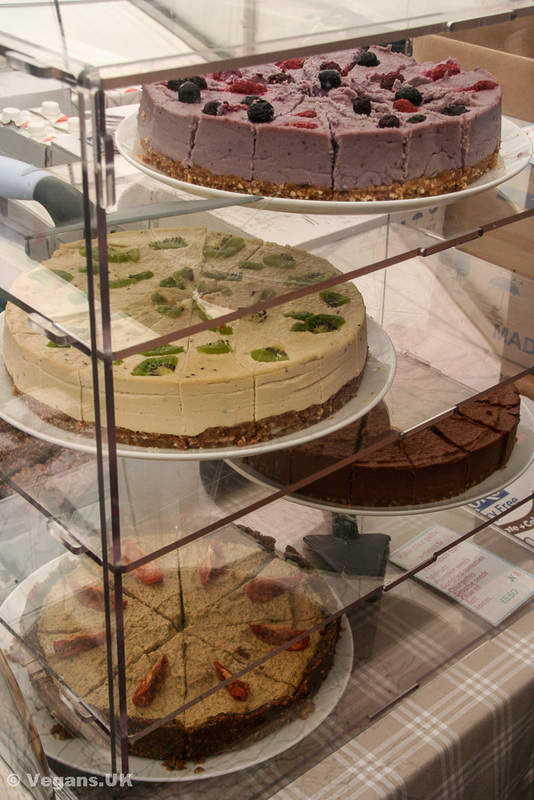 By far the prettiest stall belonged to Paradise Unbakery, a purveyor of raw cakes and other delights. Coming close in the looks stakes were Rawsome cakes and chocolates, and of course the ever-welcome Ms Cupcake. There were many free samples by Life Food, Nectar Foods, Pulsin, Aduna, Sheese, Ananda Foods, Nakd, Koko, Beech’s and countless others. Needless to say, I partook of a fair few vegan cheeses and chocolates, but also foods which I’d never heard of before and was pleasantly surprised by. The caterers were flawless and on the Saturday it was so hot that it came as no surprise to find the Pimms tent and the Ice Cold Lemonade stall had healthy queues all day. The vegan ice cream and ice lollies disappeared as well and personally, I headed for the beer tent. Pitfields had a rather groovy set up with a record player – dare I say, rather a hipster vibe. Being in Bristol, there was also a healthy amount of cider provided by the bars. Of course I’m not one to drink on an empty stomach (no ‘eating’s cheating’ for me) so I was forced to choose from the many and varied caterers onsite. Well, my first choice was a good ‘un as the pizza, baked before your eyes in a wood-fired oven, provided by Pandemania Wood Fired Pizza was sublime. Although not a vegan company, all their ingredients are fresh and veganising their superb product is easy. I also managed to fit in some macaroni cheese from The Spotless Leopard van which was fab. Before the weekend was over I managed to sample some of Bangwok’s glorious Pad Thai, which was heaven in a cardboard container. There were of course plenty I didn’t have time, or indeed room in my stomach, to try. Everything from paella, sushi and subs to curry, churros, kebabs and seitan sandwiches was available and certainly appreciated by the stream of hungry vegans (and non-vegans) who populated the festival on both days. On the main stage, a variety of acts performed during the day, and after many of the stalls had shut down around 5pm the music kept going till 9pm, creating a real party atmosphere. I must admit I felt the funnest act was The Captain’s Beard on Sunday, who had the crowd in the palm of their hand from their rendition of Whisky in the Jar to the ever popular (and appropriate, given their pirate costumes) What Shall we do with the Drunken Sailor? Kids and adults alike were up dancing and as the day wore on and I sipped on my can of Red Stripe, I couldn’t help but reflect on what a friendly, positive and hopeful vibe had been created. Looking out at all the people having fun and not feeling restricted at all by their choice of lifestyle was a happy sight indeed. Who ate all the – never mind. 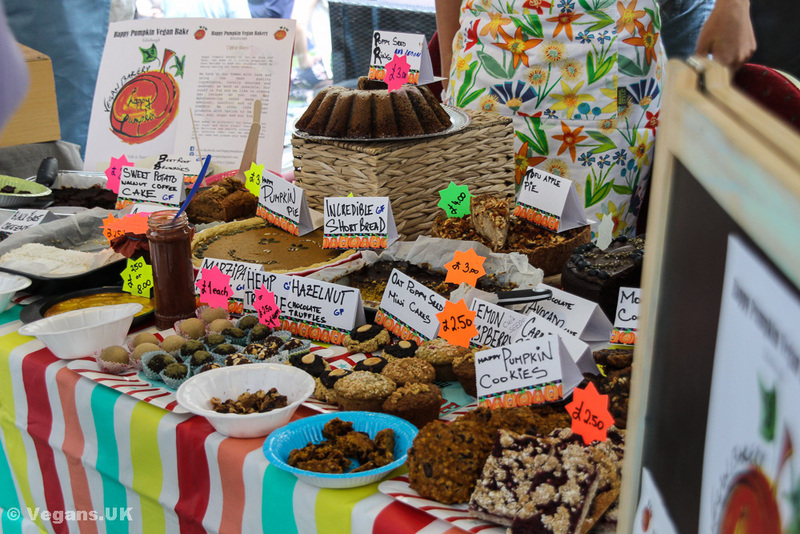 If you’ve never been to a vegan festival then chances are you might be worried it might be populated by terribly worthy people having intense discussions over a bowl of kale and some herbal tea, but nothing could be further from the truth. We like food, we like booze, we like fun. Living the cruelty free life shouldn’t make you miserable, it should give you joy. Vive le Vegfest!